Rusty Schlenk rocketed to win the UMP Sportsman season opening Bill Reckner Memorial Feature at Oakshade Raceway Saturday night. The excitement started early in the evening’s events with Pete Montrie getting turned upside down in the very first heat race. Montrie climbed out under his own power, but was done for the night. In the feature, Josh Steinacker tried to hold off Schlenk on the first lap after starting on the pole. The two drivers completed lap number one side by side. Schlenk then assumed the lead and began to pull away. Joe Derbeck and Bob Gregory were battling hard for for the third position when the two made contact and bounced off one another. Derbeck continued on, but Gregory slowed and rolled to a stop to bring out the second caution period of the race at the halfway point. Steinacker challenged Schlenk for the lead on the restart and that would be as close as he would get as Schlenk pulled away to the easy victory. The Jackson, MI driver had nine Sportsman Feature wins last year and starts off 2006 in his Bailey’s Body Shop sponsored machine right were he left off last season. Tim Bernard finished third behind Steinacker with Billy Ruff and defending champ, Ray Klawitter rounding out the top five finishers. The Bombers put on a very exciting Bill Reckner Memorial Bomber A Main with B.J. Gregory and Jake Rendel battling for the lead early. Gregory held the lead until the restart after a lap five caution. Rendel got the jump and snuck by on the inside. Gregory then began to backslide through the top five. Tom Ordway took over second with Jim Scout closing. Scout passed Ordway for second on lap nine of the 20-lap event and then took the lead from Rendel two laps later. Rendel and Ordway made it a tight battle for the lead with defending Bomber Champion Jim Scout in the closing laps of the race with Rendel reassuming the lead briefly just five laps from the finish. One lap later, Scout reclaimed the top spot and went on to win. Rendel held off Ordway for second with Dan Bleikamp finishing fourth. B.J. Gregory settled for fifth. Hugh Snell and Dan Dippman were early leaders in the Bomber B Main, but Danny Hogrefe turned out to be the man to beat after he took the lead on lap number four. Hogrefe pulled away from the rest of the field for the easy victory, but a heated battle for second kept things interesting. Dippman was trying to fend off a hard charging Jacob Gamber. In the end, Gamber got by on the high side to finish second and Dippman bounced off the backstretch wall coming off turn two, but managed to hold on to third. Snell was fourth and Bill Garland finished fifth. Kevin Hanford looked impressive for the first three quarters of a lap in the Bomber C Main by shooting out into the lead until he lost a tire coming off turn 3. That turned the lead over to Rob Anderzack. Jerry Signor was running second about midway through the race when the backend came around coming off turn four. Signor got his car corrected and continued on without a caution, but fell to the back of the pack. Scott Mills was on the move working his way up to second by lap five after starting further back in the field, but not even Mills could catch Anderzack who finished about a half lap ahead of Mills. Wade Rick finished third followed by Dustin Sautter and Mark Pollack. 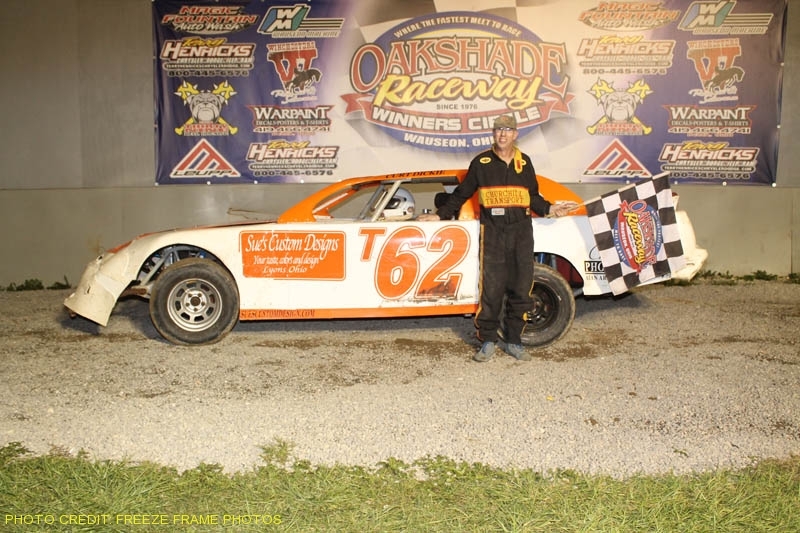 Oakshade Raceway returns with the first complete regular racing program of the year on Saturday, May 6, with three divisions of racing; UMP Late Models, UMP Sportsman and the Bombers. Gates open at 4pm with racing at 7pm.